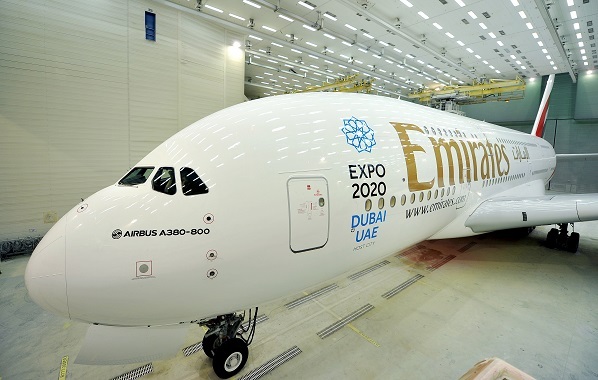 The Emirates Aircraft Appearance Centre, the world’s largest aircraft painting facility owned by an airline, has completely stripped and repainted 33 aircraft last year, or 13 per cent of the Emirates fleet, reports Phil Blizzard in Dubai. During the year, Emirates gave a fresh coat of paint to three Airbus A380s and 22 Boeing 777s, in addition to eight aircraft that were retired as a part of the airline’s strategy to operate a young, modern, and efficient aircraft fleet. Emirates’ state-of-the-art facility in Dubai also installed decals on 72 aircraft and executed over 105,000 painting jobs including cabin touch-ups across the world’s largest fleet of wide-body aircraft in 2015. As well as being an important visible aspect of branding Emirates makes sure that all its aircraft are in top operating condition from a technical standpoint. The airline takes great pride in ensuring every aspect of its aircraft appearance meets the highest standards and can also impact operating and technical performance. A good paint job for instance, can help reduce fuel burn, and a smooth turnaround at the Aircraft Appearance Centre helps return the aircraft to scheduled service more quickly. Emirates has also pioneered an innovation in the A380 repainting process by using a new adhesion promoter which ensures enhanced paint durability and longevity. Airbus is recommending this indigenously developed feature to other A380 operators who will be repainting their aircraft. In addition to this, the team succeeded in shaving off a few hundred kilograms from the weight of a number of the A380s, contributing to better operational efficiency, enhanced technical performance and cost savings. Emirates is working closely with aircraft manufacturers and industry partners around the world to introduce better efficiencies in aircraft paint application, with an eye on efficiency and eco-friendliness. Twice the size of a football pitch and operational round-the-clock, the Emirates Aircraft Appearance Centre uses the latest technologies and systems, including fully controlled environments that regulate temperature, humidity and airflow – all critical factors for the perfect glossy coat. That is why Emirates has invested in a world-class facility, technologies, and its people, to ensure that the airline has its own in-house capability. The process for repainting an A380 involves four different stages starting from: preparing and masking the aircraft to protect sensitive components from paint application; chemical stripping of existing paint; sanding of external surfaces followed by the actual phase of repainting which comprises of pre-treatment, painting of the aircraft with various coats, marking of signs and finally, the application of a clear coat for gloss retention. This is followed by an exhaustive inspection and quality assurance check before the aircraft is released back into service. A team of 34 professionals worked for nearly 6,000 man hours to complete the repainting of ‘Echo Delta Delta’, the fourth A380 to join the Emirates fleet. The mammoth ‘strip and repaint’ makeover was completed in 15 days, setting a new company record. The painting part of the process took just seven days. Seven coats of paint weighing 1,100 kilograms were applied on ‘Echo Delta Delta’, covering an area of 3,076 square meters. The entire exterior of the A380 including the fuselage, wings, engines as well as vertical and horizontal stabilizers received a makeover. The paint coats on the fuselage comprised of one layer each of a primer and sealer, followed by three coats of Brilliant White, which is the custom Emirates colour, and then two layers of clear coat and decorative paints for the Emirates insignia and logo. Emirates is the world’s second airline to undertake this complex paint job of gargantuan proportions, and it repaints an A380 after every seven to eight years of service, or earlier if the aircraft requires it. As the world’s largest operator and customer of the A380, Emirates is expected to repaint more A380s than any other airline in the years to come.